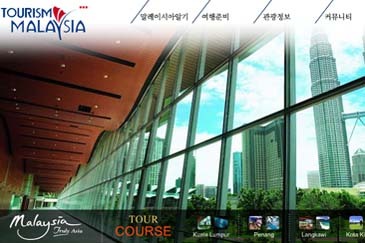 On the occasion of "'Visit Malaysia Year 2007," Malaysia Tourism Promotion Board has recently renewed its website (www.mtpb.co.kr). The renewal is aimed at swiftly providing information on its 'Visit Malaysia Year 2007" campaign as well as practical information on tourism in general. Much easier accessibility is another feature of its upgraded website. The Malaysian tourism website is focused on providing tour information to the individual tourist with its well-arranged categories tailored to suit customers seeking specific information. The information, categorized by themes, includes local accommodations, food, and regions. The regional information on such major tourist spots as Kuala Lumpur, Penang, Langkawi, and Kota Kinabalu, is provided along with a display of a related map. The themed information includes honeymoon destinations, golf courses, family tours, spas, mountain climbing, marine sports, and ecotourism. Malaysian traditional music and video clips on local scenes will add special flavor for visitors to the website.